Virtue Falls by Christina Dodd, a Mysterious Review. Review: As a young child, Elizabeth Banner witnessed the murder of her mother. Her father was convicted of the crime, and she grew up with an aunt and her family. 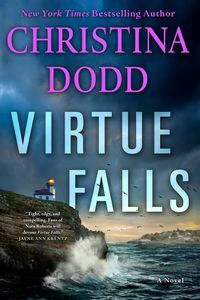 Now 29, she has returned to her hometown of Virtue Falls, Washington, as a geologist — the same profession as her father — to study the rich coastal area of the state, only to discover evidence that may prove someone else killed her mother, someone who may kill again, in Virtue Falls, a novel of suspense by Christina Dodd. Elizabeth did not speak for over two years after her mother's murder, and she really cannot remember many of the details of that day. Growing up, she was verbally abused by her aunt and ostracized by her cousins. As a consequence, she grew to distrust those around her, keeping everyone at arm's length. Divorced and nearing 30 now, she has decided it is time to face her past in order to move forward with the future, and she has returned to Virtue Falls. And she needs to make peace with her father, a victim of Alzheimer's, who is in a long-term prison care facility nearby. When a massive earthquake rumbles through Virtue Falls, followed by a tsunami, more than the earth exposes the destruction of time. Long concealed secrets are brought to bear regarding Elizabeth's failed marriage to Garik Jacobsen, on suspension from the FBI, her ex-husband's feeling of guilt because of his past, the death of her mother, and the innocence or guilt of her father. If her father did not kill her mother who did? As Elizabeth tries to understand the mystery of her mother's murder with the help of Garik, she realizes that evil sometimes happens to good people and sometimes good people do bad things that they regret for a lifetime. There is a lot of depth to the characters and setting of Virtue Falls. One has the sensation of accompanying Elizabeth and Garik as they try to learn more about what happened so long ago, of feeling the danger when the earthquake strikers, and of running to higher ground as the huge waves approach off the Pacific. This is a wonderful blending of mystery, suspense, and romance, and is highly recommended. Special thanks to guest reviewer Betty of The Betz Review for contributing her review of Virtue Falls. Acknowledgment: St. Martin's Press provided a copy of Virtue Falls for this review.